Serendipity and opportunity can place one on an unexpected path. This could lead researchers to wonder if they were “chosen” for a quest. Greg and Lora Little might just ask that question. The Little’s are a well-educated couple who have acquired some unusual hobbies. Dr. Lora Little is a respected psycho-therapist, Administrator and writer who became an in-the-field historical investigator. Her husband, Dr. Greg Little, is a criminal psychologist who became active in archaeological investigations after experiencing the same dream 10 nights in a row. “I had a series of dreams, for as best as I can recall, 10 nights in a row… these came from literally out of nowhere! I was standing on an Indian mound and I took a picture… and then I am on another mound and I take another picture and this went on all night long night after night after night! It was strange because everything I knew about Indian mounds could be written on the back of a postage stamp!… Nothing was taught about Indian mounds in history… Very little was taught in high-school. Lora and I had a… vision of a spider and we went to a mound site in Memphis and saw this spider and I suddenly knew what I needed to do is to go to every possible Indian mound site and try to document what was left of them; take a picture of them, write down the details and so on” (From Earth-Keeper radio interview on Youtube. See https://www.youtube.com/watch?v=Yfbe8tRyhVM). Little became acquainted with over a hundred mound sites in 41 states. He kept at it for ten years, taking trips “virtually every week”, and his efforts culminated in the 2008 Illustrated Encyclopedia of Native American Indian Mounds & Earthworks – recently revised, updated, and enhanced in 2016. Over 1 million Native American mounds may have once existed but only 100,000 or so now remain. Even more striking are astronomical alignments and geometric designs of the native earth-works. Some acting as an accurate lunar calendar. This means the ancient Native American was much more advanced than previously thought. Greg Little eventually came across Native American ideas that led to his 2014 book, Path of Souls: The Native American Death Journey. A journey not unlike that experienced by ancient Egyptians. The resemblance suggests that humanity reports common “life after death” experiences and mystical traditions might share an origin in pre-history. There is more to our past than the accepted and official version of things. As a young girl, Lora Little kept taking the same book by Ignatius Donnelly out of the public library. The book was on Atlantis and her fascination with the subject kept growing over the years, especially when she became interested in the Edgar Cayce readings. Cayce had much to say about Atlantis and eventually Lora began writing articles on the subject. It is interesting to Lora that the story of Atlantis resonates with so many people. It is almost as if a memory of some civilization-destroying disaster resides in our (Jungian) collective unconscious. Her husband Greg had other interests but became “inspired” to look closer at the topic after reading Andrew Collins’ book “Gateway to Atlantis” (Now reprinted and expanded as “Atlantis in the Caribbean”) – a book that highlights Collins’ extensive research in the area. Many “enigmatic discoveries” by people like Charles Berlitz, Manson Valentine and others have left us to ponder if Atlantis might be located somewhere in the Caribbean or what is now the ocean East of Florida. 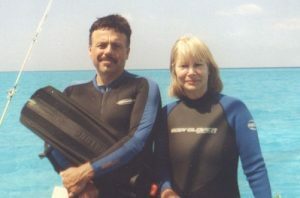 The couple decided to dive in the Bimini area and were eventually turned onto a strange underwater site now known as “Brown’s Ruins”. Although the Biminian government have now protected the site as archaeological, officials have yet to declare Brown’s ruins as Atlantean. In order for this judgement to be made, Brown’s ruins and other potential sites need to be excavated by qualified and licensed archaeological teams and incontrovertible evidence must be uncovered. This is exciting new territory for marine archaeology and many hope funds will be raised and teams assembled so we do not have to wait too long for excavation. The expense of mounting an expedition is one thing but the dangers of sea are quite another. The area east of Flordia is where the infamous Bermuda Triangle is located! A place some claim to be full of magnetic anomalies and unpredictable storms. The Littles have returned to dive on the Great Bahamas Bank dozens of times. They have explored underwater sites near Andros Island and the infamous Bimini Road. Greg Little has actively disputed debunker claims that the road is just a natural formation. He points out other anomalous structures near the Island that suggest an alternative history. Lora Little has been active in promoting the Edgar Cayce Association to Research and Enlightenment (or A.R.E. ), as a non-profit community-oriented group. Cayce, the famous psychic and Christian mystic gave readings to help diagnose and remedy physical ailments experienced by thousands of patients. Today, the A.R.E. house and care for Cayce’s some 14,000 or so readings. In his time, Cayce became so renowned that wealthy entrepreneurs paid him to help them uncover potential mining sites. One of these was Bimini off the coast of Florida. But while in trance, in addition to reporting veins of gold Cayce began speaking of the Bimini area as an ancient place known as “Poseida” (the name being similar to that of the ancient Greek god known as Poseidon). This was a location Cayce later identified as one of the three main islands of Atlantis. 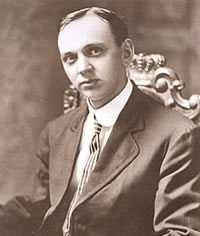 Edgar Cayce is an early contributor to psychic archaeology. Rarely considered by mainstream archaeologists, psychic archaeology is the application of non-ordinary human abilities to research our collective mystery. In other words, the “sixth sense” is enlisted to help locate sites, read artifacts and assist in piecing together the past. Cayce identified 3 sites for the Atlantean Hall of Records – that is a sort of library of tablet documents that give information on Atlantis and the history of man before 9600 BCE. Cayce said one was under the Sphinx in Egypt, one was in a temple under the sea near the Bahamas and a 3rd was in the “Yucatan”, or Mayan area of central Mexico. Says Lora, “after many years of writing about the subject of Atlantis and Cayce’s Hall of Records and Cayce’s Hall of Records, Greg and I did decide finally that just writing about it was not enough. I became immersed in the search for the Yucatan Hall of Records and am convinced that the Cayce readings do point to Piedra Negras, Guatemala as the location”. (see http://mysterious-america.com/loralittleinterv.html). Well buried in the deep Guatemalan jungle, getting to Piedras Negras was anything but easy. After travelling to Tikal in Guatemala, the Littles had to take a 5-hour drive followed by a 6-hour boat ride up the rapid and crocodile-infested Usumacinta river. Dangerous men are often seen here working the drug trade or illegal immigration schemes. The Littles had to be watchful. Arriving at the site, they found it covered in jungle, including the acropolis but on the river bank they found a Mayan circular platform where 2 characters are portrayed – one man is handing another a book. The Littles wondered if this might be similar to the “sun-dial” reported by Cayce with regards to the Yucatan Hall of Records site. Earlier archaeological diggings revealed layer after layer of construction from different eras but the original settlement is dated to the 7th century B.C.E – too young to be associated directly with the fall of Plato’s Atlantis in approximately 9600 B.C.E. Yet, it is possible the site held a sacred or special place in the minds of locals prior to settlement. One of the largest cenotes is nearby and such bodies of water play a spiritual role in Mesoamerican life (see http://www.mexicolore.co.uk/maya/home/sacred-sinkholes). In a 1939 reading Cayce said the chambers containing the Yucatan the Hall of Records were “overshadowed” by a temple. The Littles wondered if the the Hall of Records might be under Piedra Negra. 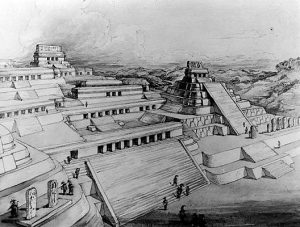 Greg Little says in his ‘The Yucatan Hall of Records: The Atlantis Connection’ documentary, “it could be argued that a chamber under any temple or a pyramid is overshadowed by the structure above it”. (see video below for more about their expedition).